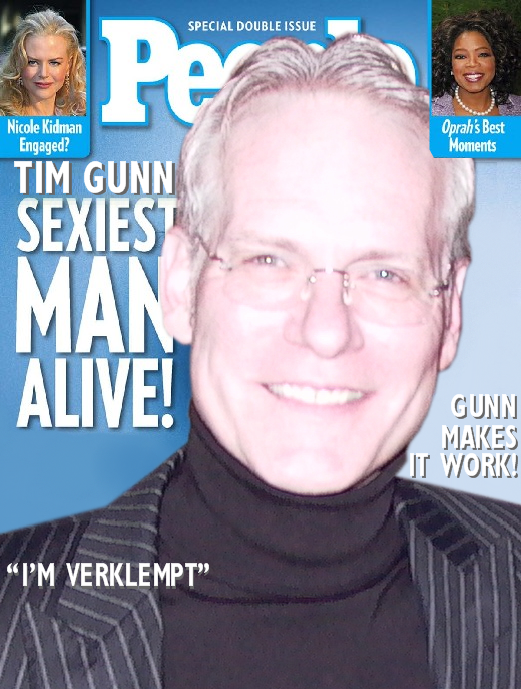 You missed Tim Gunn's Makeover. 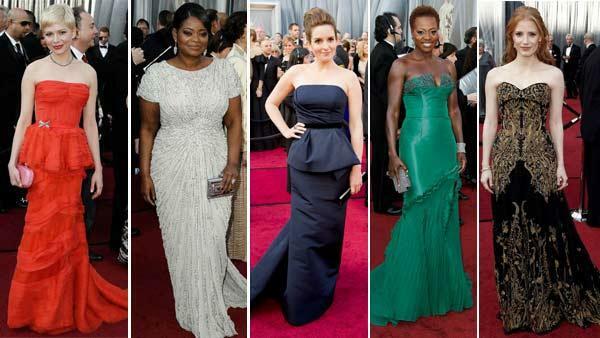 These five gowns were Tim's top looks at the Academy Awards. Do you agree? Episode 8 garments are available for your bids. Right now, Mondo's winning design has the highest price. Click here to see all of the auctions. There is still time to vote in our poll for episode 8. Heidi and Michael interview one another for the March issue of German Vogue. BPR friend, Curtis Seaman provides a translation of the interview here. An update from Project Runway Season 5 designer, Wesley Nault. All photos: Lauren Powzyk and Joseph Gray. 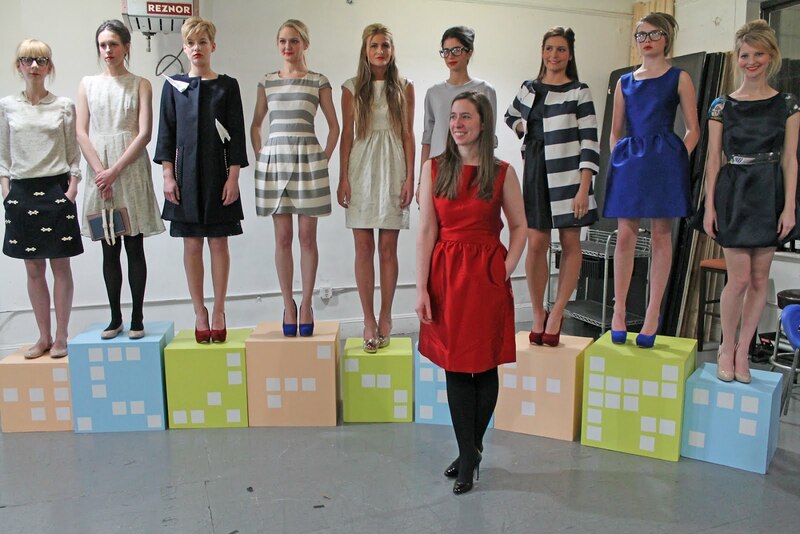 The all-star fashionistas plug into light technology to design avant-garde creations. Musician Pharrell Williams is the guest judge. 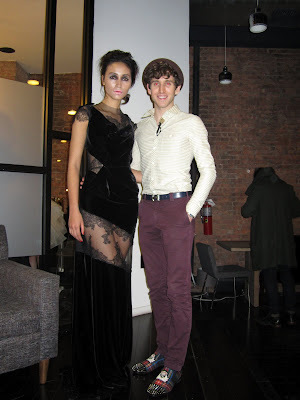 Project Runway All Star designer, Mila Hermanovski talks about her experience on the show. A highlight: Mila is currently working as a costume designer on the newest Star Trek film! Click here for a full transcript of the interview. BPR Oscar Red Carpet Party! Thank you recappers - see you next week! Have a PRAS recap to share? E-mail the link to Team BPR. Attention chat friends! BPR will be hosting a live chat room party tomorrow night for the Oscar Red Carpet. Join Tbone and crew as we offer our snarky takes on this American celebrity worship ritual. 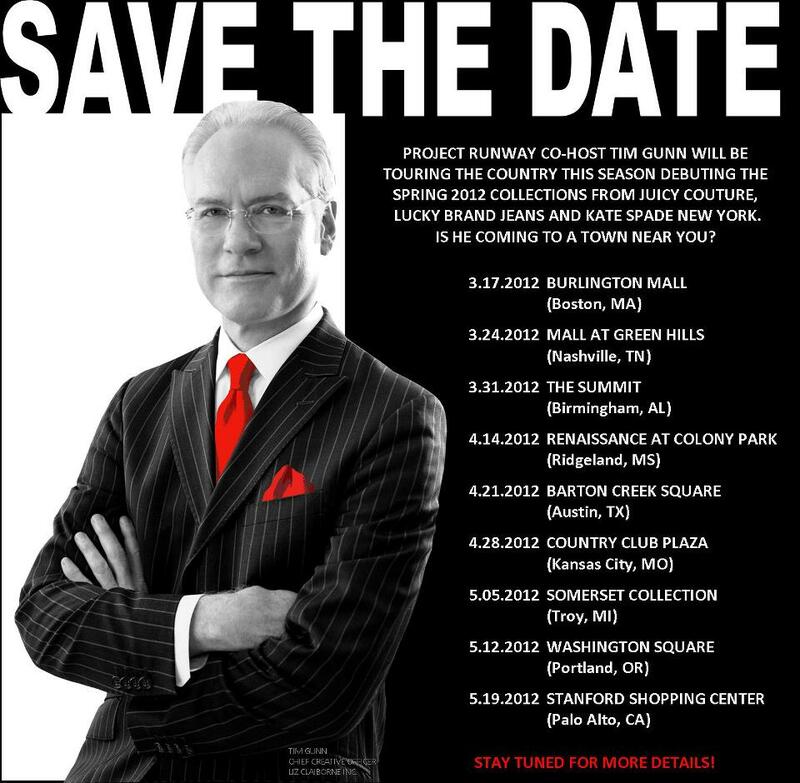 Of course we'll also be keeping an eye on our Project Runway connections as Nick Verreos hosts on TV Guide Channel and Tim Gunn does another turn for ABC, this time with Nina Garcia. BPR's Red carpet party room goes live at 6:00 p.m. ET on Sunday. Hope you can join us! Tune in to the TV Guide Network on Sunday for Nick's "Red Carpet Countdown." 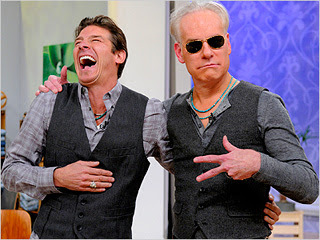 Nick returns on Monday for the TV Guide Academy Awards "Fashion Wrap." You've seen the designs on the runway and now it's your turn to be the judges. This week you are Angela Lindvall, Georgina Chapman, Isaac Mizrahi and Catherine Malandrino. Click here to tell us who should have won. Project Runway All Stars reached for a little international flavor tonight as the final seven fought to stay in the competition. What did you think of the challenge and the results? Post your reactions to Episode 8 here. Our six remaining All Star designers head over to the East River and the UN Headquarters for tonight's flag-themed challenge. The fabulous Catherine Malandrino serves as guest judge. 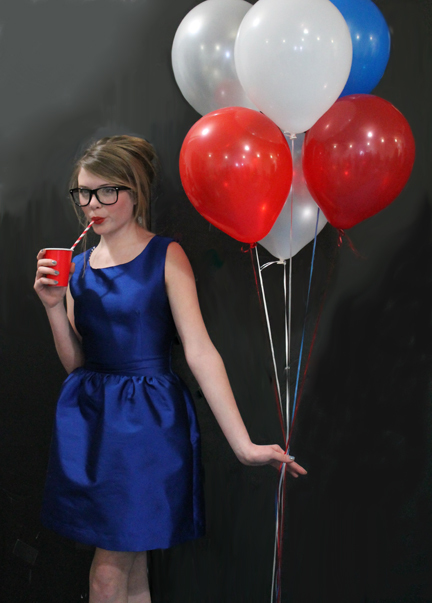 BPR will be serving up its own bit of fabulosity with hostess suzq in the BPR party room. 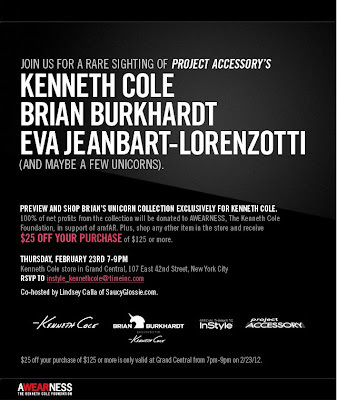 That Tbone dude will be trolling around as well and all of you are invited to join the fun as we snark our way through another new episode of Project Runway All Stars. Bonus: "After The Runway" with Joanna Coles and Isaac Mizrahi debuts tonight at 10:00 p.m. The party room will remain open! Doors open at 8:45 p.m. See you tonight on BPR! Our polls for Episode 7 are closed. You agreed with the judges and felt that Mondo Guerra deserved the win. Click here to see the results. You also concurred with the judges and felt that Kara should have been out. Click here to see the results. Check back with us tomorrow for our Episode 8 poll. Episode 7 auctions are underway! Right now, Mondo's design has the highest bid. Click here to see all of the auction items and to place your bid. 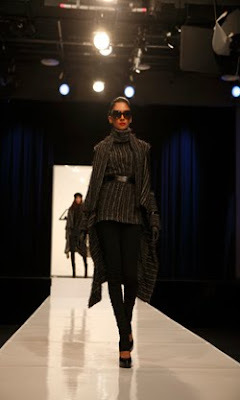 Project Runway Season 3 designer, Malan Breton, presented his Fall 2012 Collection on Feb . 14th. BPR Field reporter, Jennifer Mara sends us this report. Thanks Jen! 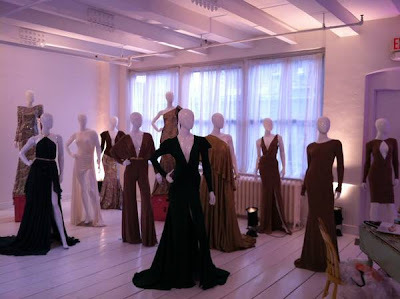 Those who attended the Fall 2012 Malan Breton Presentation in Chelsea this past week enjoyed a great show. This is what Fashion Week is all about. 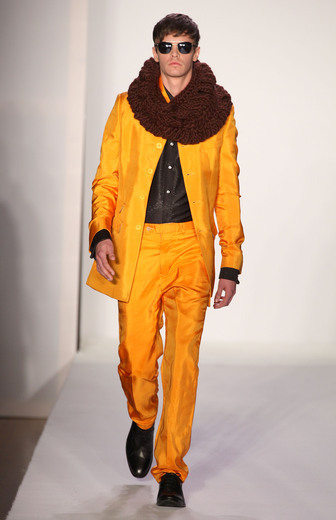 Malan showed a variety of menswear looks, each complemented by architecturally awesome accessories and bursts of color! Three evening gowns appeared in the collection, each more intriguing than the next perfectly spaced at the beginning, middle and end of the show. The black mini with the sheer bottom definitely made some jaws drop. Malan is not afraid of color- that’s for sure. His detailing and fabric choices let each look live vibrantly. 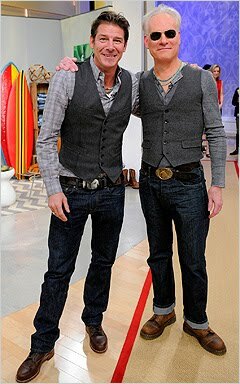 Eye catching and beautiful each with their own personality, with cohesion throughout and the shoes…AMAZING! Futuristic line-designed high-tops and men's dress shoes with a reverse cut stencil heel backing - Malan was wearing them too!!! 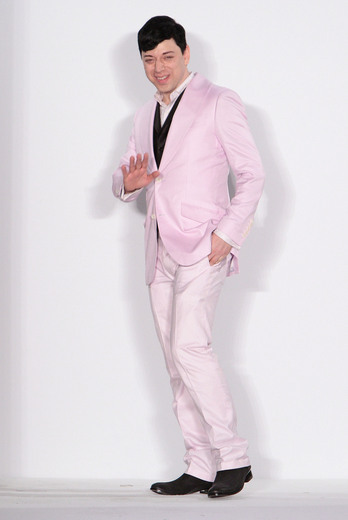 Boy, did he look snazzy in a pale pink suit. Click here for more photos from the show. Project Runway Season 5 designer, Wesley Nault, presented his "Queen of Martyrs" collection on Feb. 16th. BPR Field Reporter Jennifer Mara sends us this report. Thanks Jen! Wesley and his favorite look from the collection. Wesley Nault prefers these presentations instead of Runway shows and the format really complements his work. As the models pose, new details reveal themselves as the viewer is able to take a closer look. Wesley sticks to a simple color palette playing with pale pinks, beige and black. Wesley isn’t afraid to really show his work- his tailoring and craftsmanship are high above the bar. He took everything to next level for this show. Great Job Mr. Nault. Can’t wait for the next one! 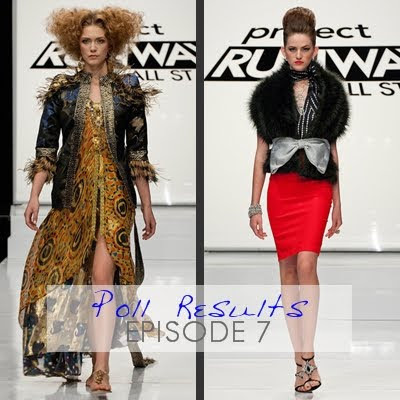 There is still time to vote in our Project Runway All Stars Episode 7 Poll. Do you agree with the judges? Kenley and Kara, "Silver Roots"
Project Runway Season 3 designer, Malan Breton, presented his Fall 2012 Collection at The Metropolitan Pavilion on February 14th. Project Runway Season 2 winner, Chloe Dao, is expanding her business and her brand. 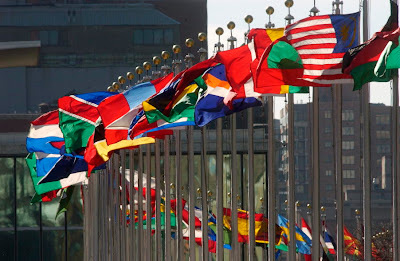 The all-star clothiers visit the United Nations headquarters and use flags as inspiration to create dresses. Designer Catherine Malandrino is the guest judge. 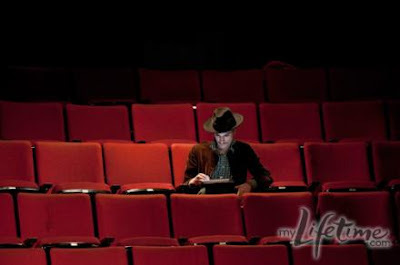 And Toyouke was looking for a shady theater. Thank you again recappers! Have a PRAS recap to share? E-mail the link to Team BPR. Click here for another exit interview with Kara Janx from RealityWanted. You've seen the designs on the runway and now it's your turn to be the judges. This week you are Angela Lindvall, Georgina Chapman, Isaac Mizrahi and Sutton Foster. The Project Runway All Stars gave their regards to Broadway tonight and one designer takes their final bow. Post your reactions to Episode 7 here. Project Runway Season 10 - Now Casting! The minimum age to apply for the show is 21. Casting is critical to the success of this show and we would love to see some serious talent in Season 10. Good luck designers! 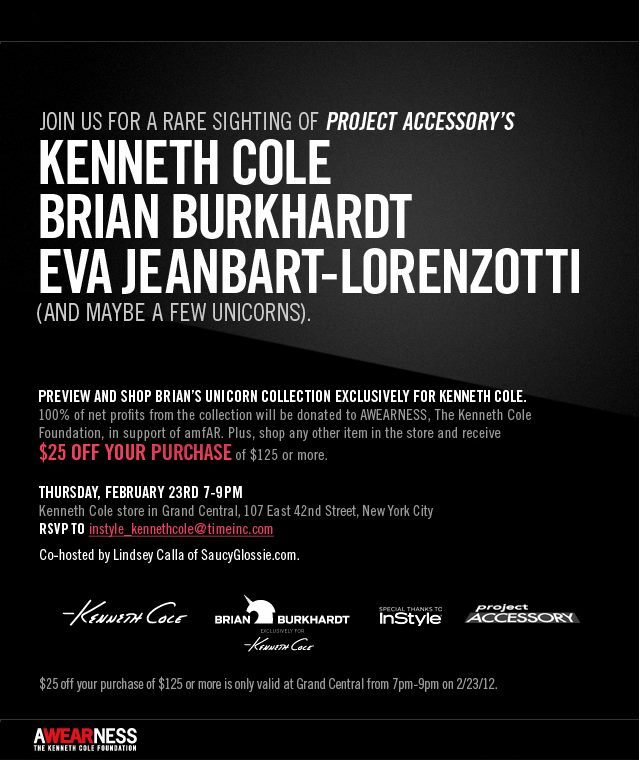 Project Accessory Season 1 Champion, Brian Burkhardt, along with judge Kenneth Cole and mentor Eva Jeanbart-Lorenzotti celebrate the release of Brian's "Unicorn" bag exclusively for Kenneth Cole on Feb. 23rd. Project Runway Season 9 finalist Viktor Luna, presented his Fall 2012 Collection on February 13th at The Chelsea Fine Arts Building--Rogue Space. for New York Fashion Week. Viktor's designs featured original custom prints inspired by artwork. The Project Runway All Stars turn into Broadway babies tonight as they design a costume for the musical "Godspell". Tbone and suzq will take center stage in opur weekly PRAS party room and you are invited to join the chorus as we watch Episode 7 together. Doors open at 8:45 p.m. See you tonight on BPR! Our polls for Episode 6 are closed. You agreed with the judges and felt that Jerell Scott deserved the win. Click here to see the results. You disagreed with the judges and felt that Kara should have been out. Click here to see the results. Check back with us tomorrow for our Episode 7 poll. Tony® Award winner, Sutton Foster is the guest judge for this week's Broadway-themed episode, "Puttin' On The Glitz." 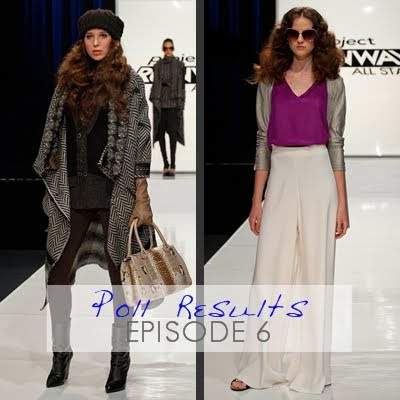 There is still time to vote in our Episode 6 poll. "Fashion Face Off" designs are available for your bids. Right now Michael Costello's garment has the highest price. What did he say on the runway?! She did that?! Burning questions from this season of Lifetime’s Project Runway All Stars will get answered with the companion series, Project Runway All Stars: After the Runway following each night’s the telecast of Project Runway All Stars, beginning Thursday, February 23 at 10pm ET/PT. Hosted by designer and All Stars judge Isaac Mizrahi and Marie Claire Editor-In-Chief and mentor for the All Stars’ designers, Joanna Coles, each episode will feature the exclusive first interview with each week’s eliminated designer as they get whittled down on the way to the finale. The half-hour show includes in-depth, roundtable debates and passionate discussions with the remaining standout designers as they answer pressing questions about what happened behind-the-seams both on and off the runway during that evening’s episode. Special guests will appear in each episode including All Stars judge and designer Georgina Chapman and Neiman Marcus’ fashion director Ken Downing. 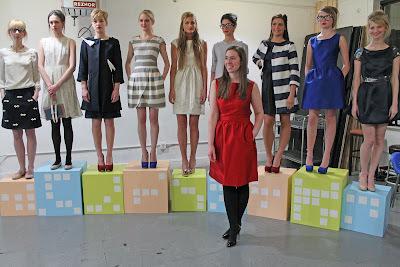 Project Runway Season 6 finalist, Althea Harper presents her Fall 2012 collection. Click here for backstage photos from Christian's show. Click here for more fashion images. Click here for beauty and hair details. Project Runway Season 6 Champion, Irina Shabayeva presented her Fall 2012 collection on February 12th. 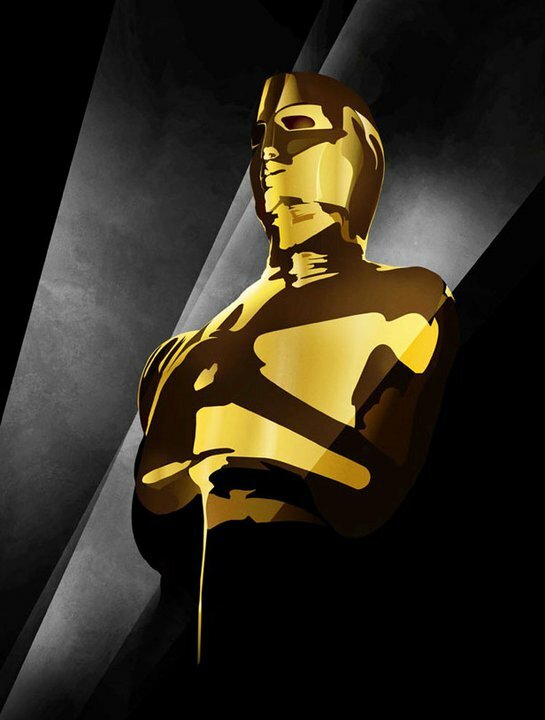 Tune in one hour before the Academy Awards Show to see Nina and Tim cover the red carpet fashions. Tim Gunn is on the road this spring! Project Runway Season 5 designer, Jennifer Diederich presented her Fall 2012 collection on February 12th and BPR field reporter, Jes Switaj sends us this report - thanks Jes! 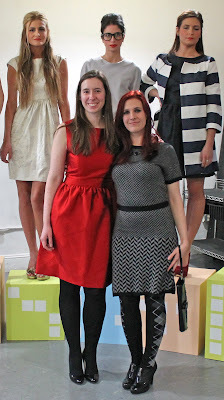 On Sunday evening I attended the presentation of Suite - Fall 2012 collection by Jennifer Diederich. It was held in an intimate studio location in Soho. Cocktails were mixed during the event by Brooklyn Sodaworks, who conjured up delicious mimosa spin-offs with their grapefruit & basil soda + champagne. Fellow S5 contestant Wesley Nault was also in attendance. The Suite collection was chic, tailored and charmingly feminine. Jen describes it as “inspired by a girl who feels as graceful as Audrey Hepburn on the inside and yet is clumsy and a little bit of a mess on the outside.” The collection was styled with a touch of Clark Kent (day looks) vs. Superman (night) in mind, and indeed each model definitely gave an air of chic, if not secretive, empowerment. The girls were whimsically poised atop a colorful mini cityscape with flyaway hair and no-nonsense heels. The main colors of the collection were navy, vanilla, royal blue and light grey, with touches of metallic. Pieces included a delicately crafted chiffon blouse and dress in an adorable handwriting print, a gorgeous blue party dress in lush silk wool, a super cute wool coat with fabric paper airplanes flying from the pockets and a winsome sheath dress made in a subtly metallic cloud patterned brocade. Overall the collection was finely tailored and delightfully girlish with a healthy dose of vintage charm. Congratulations Jen! Also, don’t forget to pick up your own original, handmade Suite design at Suite. 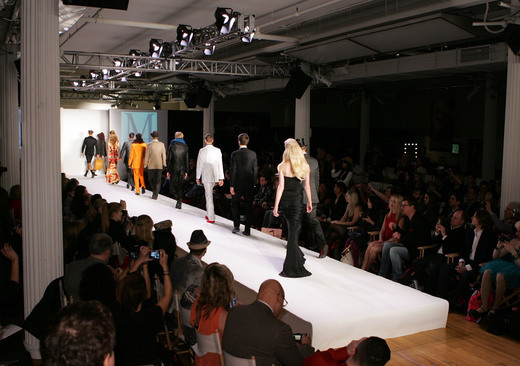 Project Runway All Star designer, Rami Kashou talks about his experience on the show. A highlight: Rami states that the best thing about the season was meeting Anthony Williams. They have become great friends. Also, Rami designed some of the costumes worn in the Super Bowl Halftime show. Click here for Rami's website. Click below to play the interview. Project Runway Season 5 Champion, Leanne Marshall presented her Fall 2012 Collection on February 12th. BPR Field Reporter Jennifer Mara sends us this report - thanks Jen! 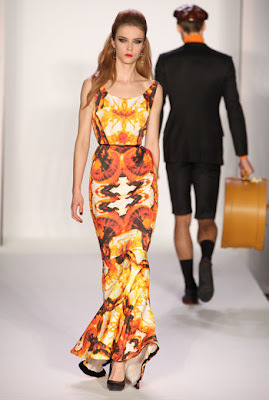 New York Fashion Week welcomed Leanne Marshall's 2012 fall collection this afternoon at The Fashion Gallery in Chelsea. Leanne's "fresh" dress collection was filled with saturated royal blues, greens, and whites, SO saturated that blue dye was left all over her hands! It was well worth it because according to Leanne, "the very last blue look is my favorite." When asked if she was thinking about her next collection she rapidly replied; "I've already started working on bridal!" Leanne also made sure to include a special shout-out to her BPR fans- "Hi Guys! I love you, thank you for all of the support and for all of your nice and touching letters, they keep me motivated and keep me striving." Suede and Korto Momolu show support for Leanne! Episode 7 Preview: "Puttin' On The Glitz"